The Bellefield Boiler Plant, whimsically nicknamed the "Cloud Factory" in Michael Chabon's novel "The Mysteries of Pittsburgh," provides steam heat to most of Oakland's major institutions. 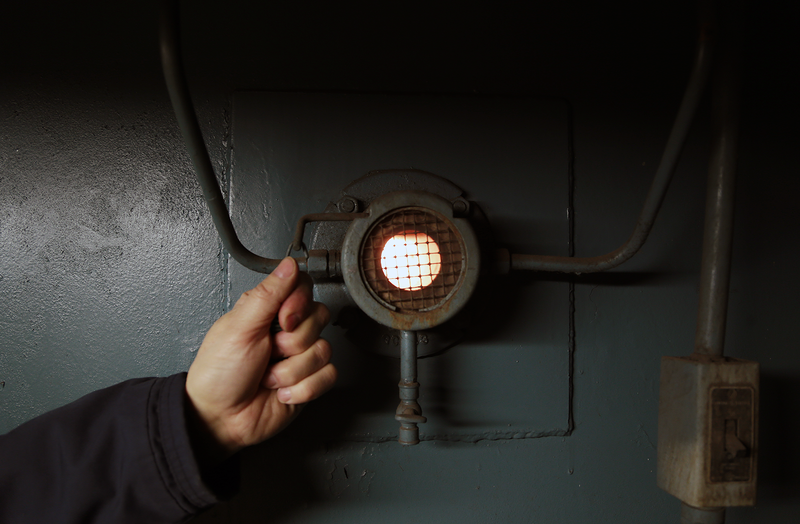 Bellefield Boiler Plant superintendent Bob Miller opens an access door to inspect a boiler's burner. 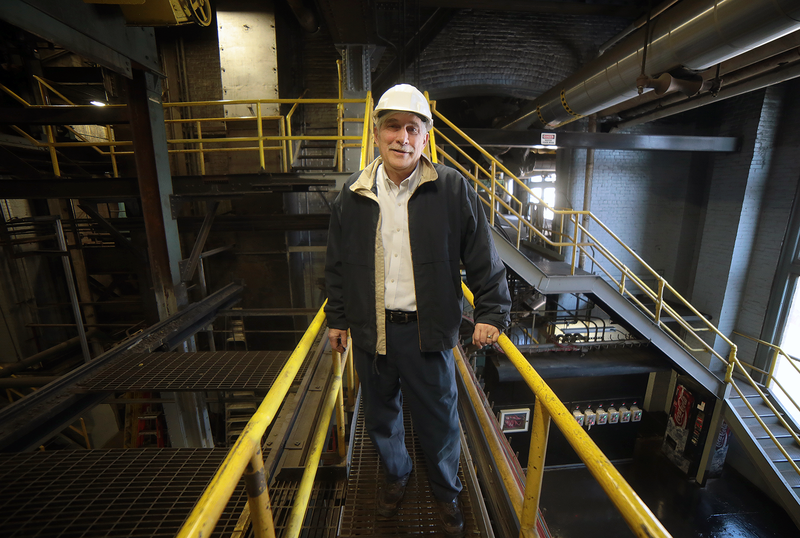 Bob Miller walks through the labyrinthine boiler plant. 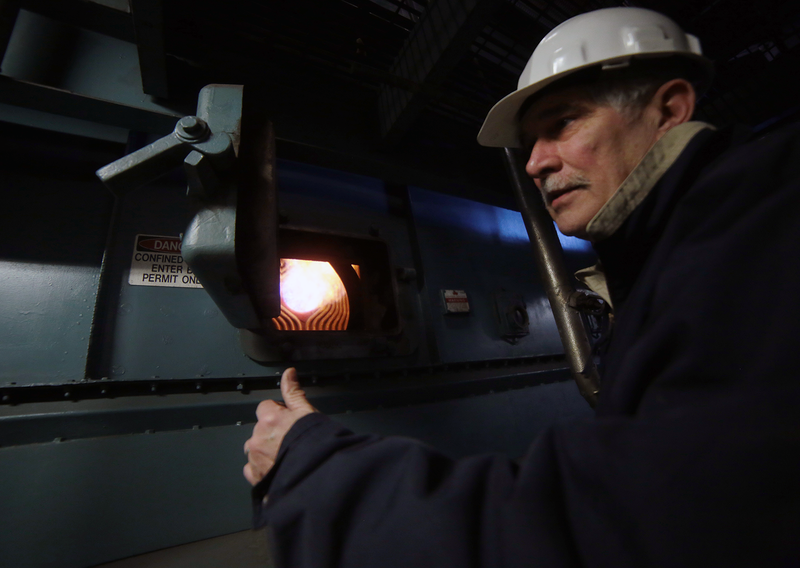 Bob Miller opens a fire port view on one of the plant's boilers. 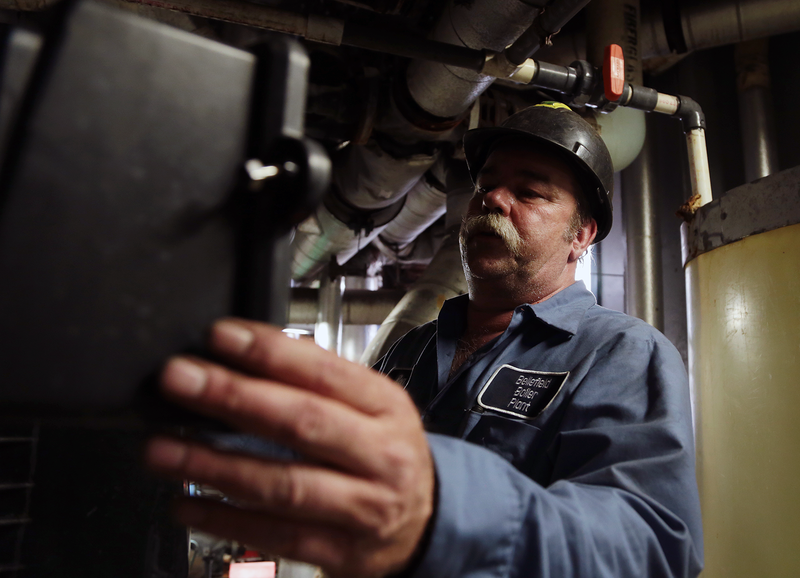 Ron Studer, a repairman at the Bellefield Boiler Plant, regenerates a water softener. 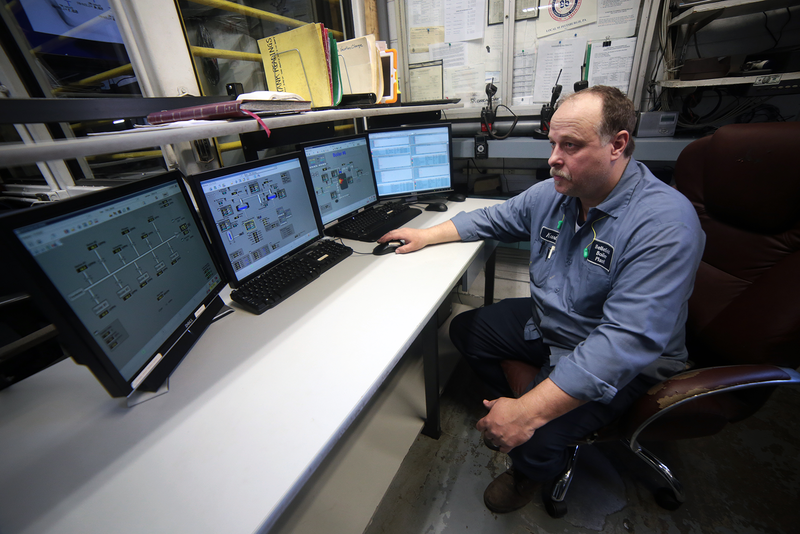 Engineer Kurt Freund monitors the plant's boilers in the control center. 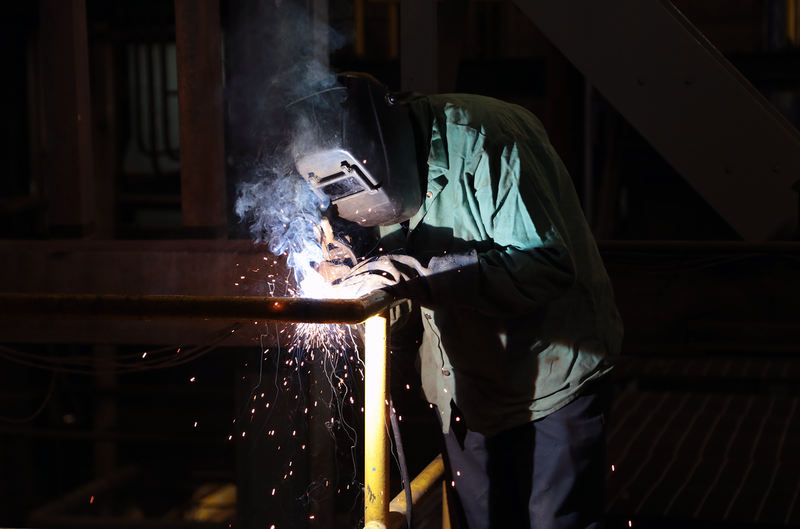 Repairman Roy Marzullo welds a handrail. The Bellefield can produce up to 480,000 pounds of steam per hour. 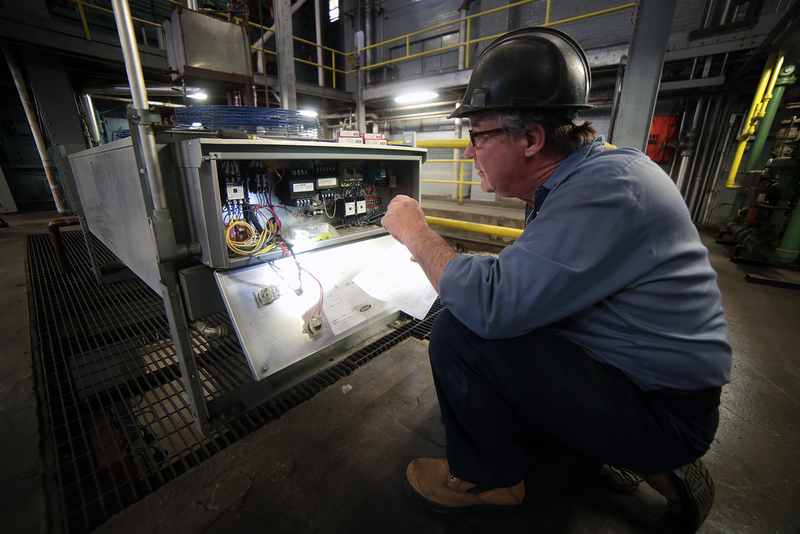 Electrician Joe McCafferty troubleshoots the controls of a closed-circuit cooling system. 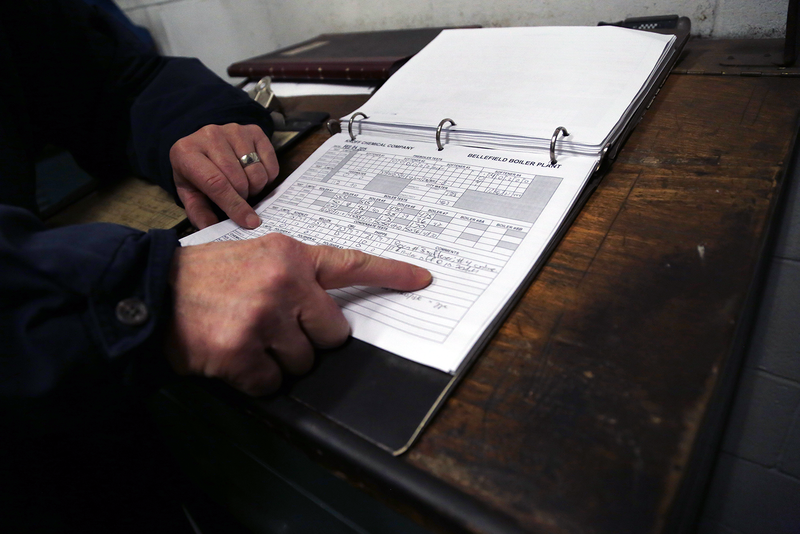 A record book keeps track of pH levels of boilers and polishers in the plant. 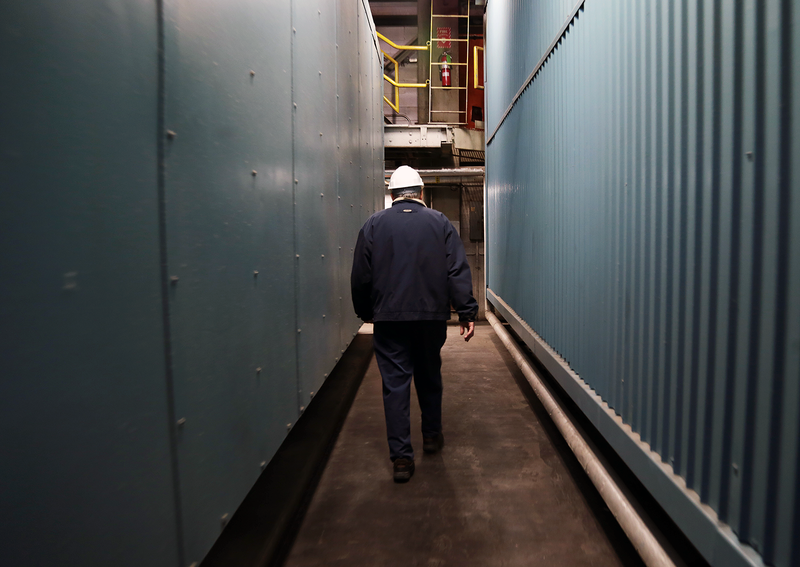 Bob Miller walks down a flight of stairs in the boiler plant. A literal powerhouse, the plant goes largely unnoticed, said Kevin Hiles, chief financial officer of Carnegie Museums and chair of the consortium that owns and operates the plant. However, there is one well-beloved clue to the plant’s existence, said the plant’s superintendent Bob Miller. 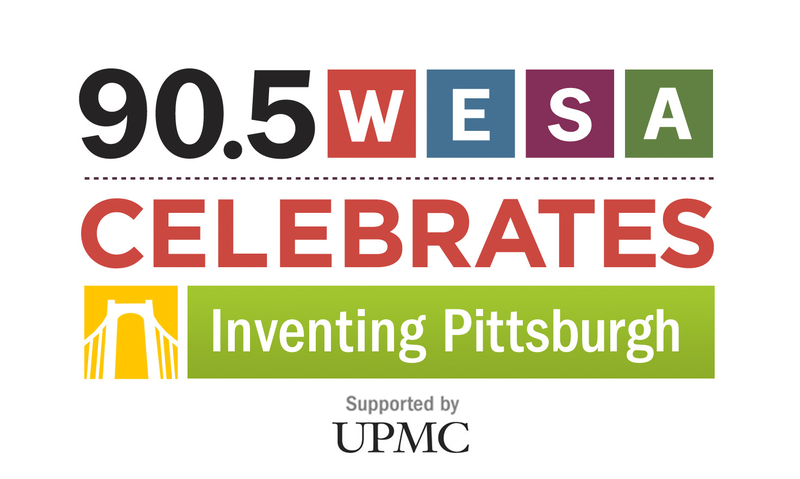 Writer Michael Chabon popularized the steam plant's whimsical "Cloud Factory" moniker in his novel "The Mysteries of Pittsburgh." 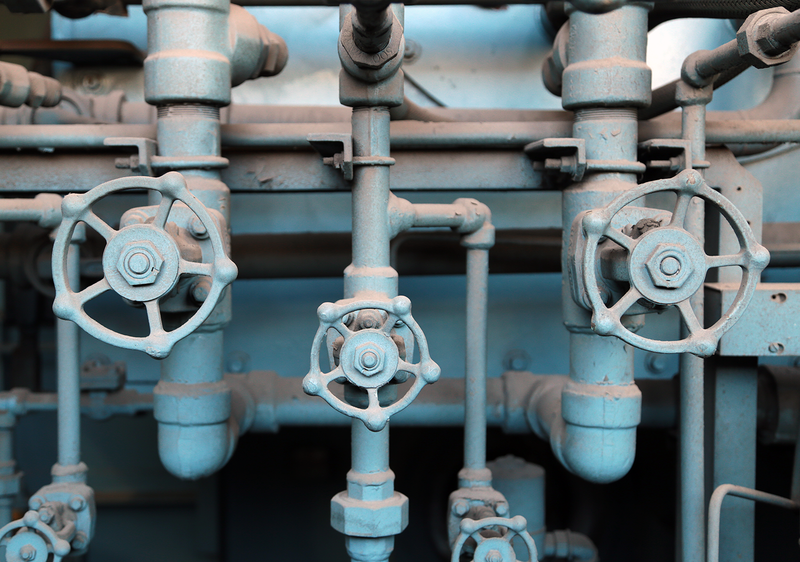 The plant can produce up to 480,000 pounds of steam per hour. In the plant’s operating room, engineers from Local 95 can monitor the entire system. Miller talked about meeting demand — putting on another boiler, taking one off — the way some people talk about putting on the teakettle. “We know around eight o’clock everyone comes into the office, they turn up the thermostat, so we’re ready for it ... they’ll have another boiler on so we have the steam demand ready for them,” he said. Before the plant switched entirely to natural gas in 2009, Bellefield ran on coal. Lots of coal. It’s an art Miller was introduced to by his father. While Miller misses the bustle of coal, he’s not naive. 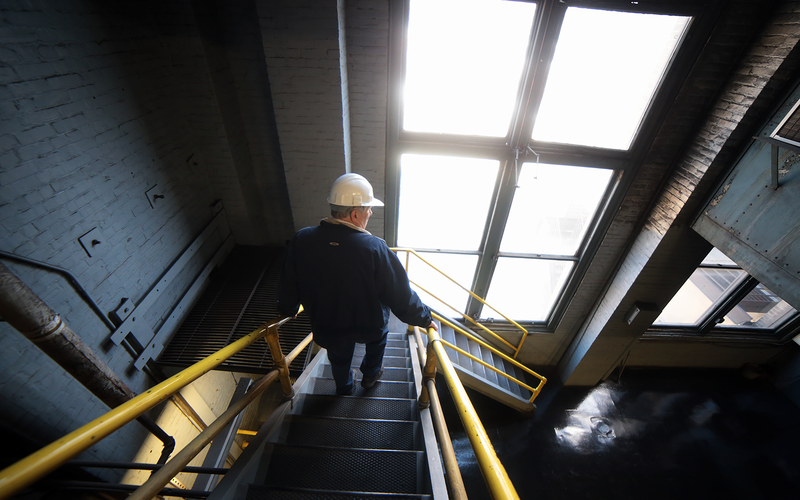 Standing on the spotless floor of the plant, half lit by sunlight streaming through windows that reach almost to the ceiling, Miller said he would prefer never to retire. If it weren’t for the telltale cloud rising from the plant’s remaining stack, it could be just another ornate building in a neighborhood of ornate buildings. But it's not. So drop by the museum, it’ll be warm there. The team just put another boiler on. The survival of the city's oldest building, the Fort Pitt Block House, is due to a group of women who refused to yield. Now that everybody is talking about war and every little boy and girl loves our flag, the stars and stripes, I want to tell you about the Fort Pitt block house of Pittsburgh, Pa., that was built many years ago in 1764...[The caretaker] said all the people of Pittsburgh loved it and that hundreds of people visited it every year. They loved the name of Washington and that made the block house dear to them. What Miss Champney doesn’t mention, and likely didn’t know, is that just ten years earlier, the Block House had only narrowly escaped destruction. That the last surviving remnant of the French and Indian War still stood was due to the Fort Pitt Society of the Daughters of the American Revolution. John Tabatchka affectionately pats his horse, Will, and flips the switch on the Electro-Groom. He begins to methodically vacuum Will’s flanks. Tabatchka is the huntsman for the Sewickley Hunt Club, one of two remaining foxhunting clubs in Western Pennsylvania. Instead of chasing a live fox, Sewickley organizes a drag hunt, in which members chase a fox’s scent through the woods. But Tabatchka’s job remains the same. “My job is to breed, raise, train and then hunt the hounds on a hunting day,” he said. Foxhunting came west over the Alleghenies with the region’s earliest European settlers and took root in the region. George Washington himself spent as much time as possible on the back of a horse. The sport is a direct link to the past, Tabatchka said. Textiles can be dangerous. A rug lead to the downfall of a Pittsburgh mayor. 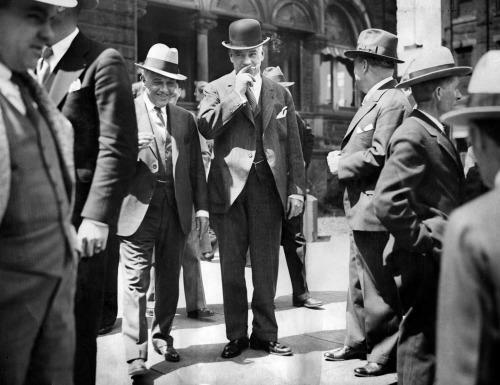 The last time Pittsburgh elected a Republican mayor, Charles H. Kline, the World War had yet to be distinguished by a I or II, the stock market had yet to crash and machine politics remained the modus operandi of most large cities. Kline took office in 1926 and was almost immediately embroiled in controversy for not following the rules of office, said Anne Madarasz, museum division director of the Heinz History Center. “At the time if you were to purchase something for the city and it was over $500, you had to put it to bid,” she said. Which is where Kline got into trouble.